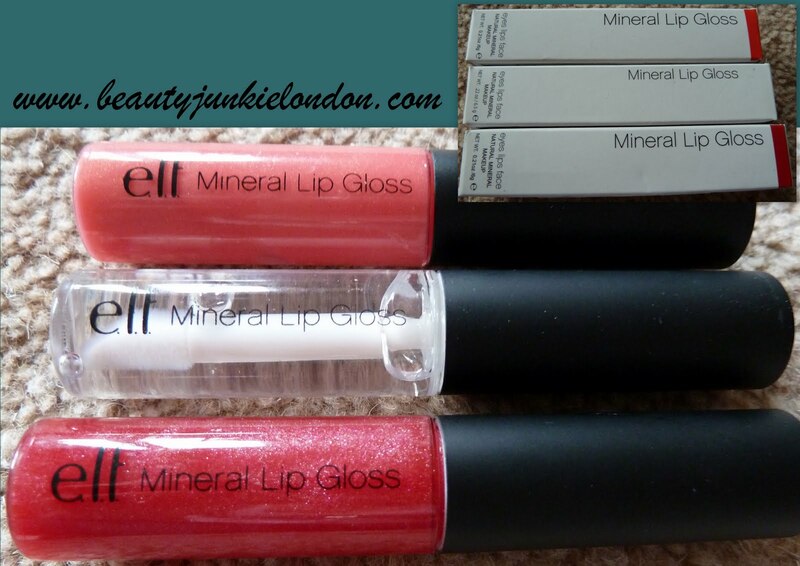 I’ve never tried any of the mineral lip products from e.l.f. before although I’ve heard many good things about them. The packaging is slick and somewhat similar to MAC – the colours look gorgeous in the tube – brightly coloured with pretty golden shimmer (other than the clear one). These three new colours ‘Wild’, ‘Daring’ and a Clear gloss. Daring is a bright red, Wild is a pinky-coral and clear is clear, clearly. All three of the glosses are paraben, preservative and chemical dye free. Plus the packaging says they are infused with vitamins A & E to give lips protection and to moisturise. Anyway, onto the colours. With names like ‘Wild’ and ‘Daring’ I expected a powerful pop of colour. In actual fact the glosses are very sheer – so these aren’t for you if you want a think slick of colour. The colours are pretty and really wearable. My personal favourite is ‘Wild’ the pinky-coral shade – it is extremely sheer (slightly more so than Daring) but a lovely colour. The golden shimmer in Daring is far more noticeable. All three of these are super glossy and not unpleasantly sticky. But I wouldn’t describe them as non-sticky. As usual with e.l.f. the swatches on the site aren’t always the easiest to get a true impression of the colour so I always think it’s a good idea to google them first to check how they look in real life. On the website Wild is far more orange and Daring more pink than they are in real life. All priced £3 from the e.l.f. website HERE. I really lite their mineral lipsticks, they are so nice! I like your suggestion about looking on google first. I have found that the website colours and the real life colours can be quite diferent too!